Aditya Yash Chopra or commonly known as Aditya Chopra (* 21 May 1971) is an Indian film director, scriptwriter and producer of the Bollywood genre. He is the son of Yash Chopra and brother of film actor Uday Chopra. 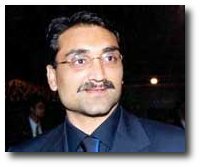 Aditya Chopra shot to fame when he directed Dilwale Dulhania Le Jayenge (1995), starring Shahrukh Khan and Kajol. The film was and still is one of the biggest box office hits in the industry. From then on he has written, produced and directed many successful films. After a five year break from directing, he came back with Mohabbatein (2000). The film brought together for the first time Amitabh Bachchan and Shahrukh Khan. It also launched the career of his brother Uday Chopra. He coproduced and wrote Veer-Zaara which was directed by his father. The film was the biggest hit of 2004. 2002 started with the quite successful Mere Yaar Ki Shaadi Hai which won the hearts of the audience because of the spoofed plot and comedic acting by Uday Chopra. However, it continued not so well because of major flop release of Mujhse Dosti Karoge!. However, the year ended off with a good note with Saathiya. 2004 was an excellent year for him and Yash Raj Films, when they had three consecutive hits with Dhoom, Hum Tum and Veer-Zaara. 2005 saw the release of Bunty Aur Babli, Salaam Namaste and Neal N Nikki. They were all hits except for the latter was a box office flop. He has produced Fanaa, Kabul Express and Dhoom 2 all released in 2006.